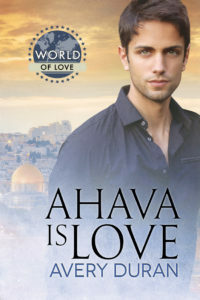 “I’m delighted to host author Avery Duran, who is joining us today for a special Chanukah blog tour with her romance Ahava is Love! I always enjoy hearing how other authors work their magic, so read on to discover what inspired Avery, how she became a “converted plotter,” and how you can enter to win an Amazon gift card. Pull up a chair, grab a cup of coffee, and enjoy! Welcome to my blog, Avery! Please tell us a bit about your book, Ahava is Love. While exploring his heritage in Israel during Chanukah, Josh, a Brooklyn Realtor meets Yaron, an Israeli security guard haunted by tragedy. The attraction is immediate, but Yaron prefers to play the field, and Josh is tired of dating players, so they decide to remain friends. They spend their days together exploring ancient sites, and their nights as roommates. Eventually, they give in to their passion, knowing that they will have to go their separate ways at the end of the trip. The more time they spend traveling, the deeper their feelings grow. But this relationship has an expiration date, and it will take a miracle to keep them together. Click here to read the full post on the Samantha Macleod blog.